Blog from Potosi, Bolivia | Where is the Love? The 2 hour journey from Sucre to Potosi was incredible passing through the Andes landscape complete with winding road and hairpin bends. On reachng the worlds highest city of Potosi (4,090m) we only have 1 day to explore as the bus to Uyuni leaves at four o`clock. With this amount of time there is only one thing to do in Potosi and that is visit the mines of Cerro Rico (The Mountain That Eats Men). The mountain itself towers over the now quaint mountain town and is the reason the place exists. The Spanish discovered the largest source of Silver the world has known within Cerro Rico and the mountain has been and remains a working mine since 1545; although Zinc is now the most profitable metal found there. Our tour is full on and begins with a visit to the miners market. This is where we buy supplies of coca leaves, crackers, dynamite, detonator, fuse, ammonium nitrate and 97% alcohol to give to the miners we will encounter on our tour. I wonder where else in the world you can walk up and buy dynamite, ammonium nitrate and detonator at your local corner shop. With our bag of supplies we take a bus up to the mine. It is difficult to describe the conditions within the mine. It is dark, cramped and appears incredibly unsafe. Absolutely no safety precautions are apparent. Following our guide we often have to crawl on hands and knee as we make our way further into the mountain. Finaly we stumble across two young miners. I say young, one is about 20 and the other around 16 years old. This is incredibly humbling after we are informed that even today a miner has a life expectancy of 15 years after starting to work in the mine before succumbing to silicosis pneumonia. Our guide explains that under Spanish rule from 1545 to 1825 the number of Black and Indian slaves, who died as a consequence of working in the mines is estimated to be over eight million. 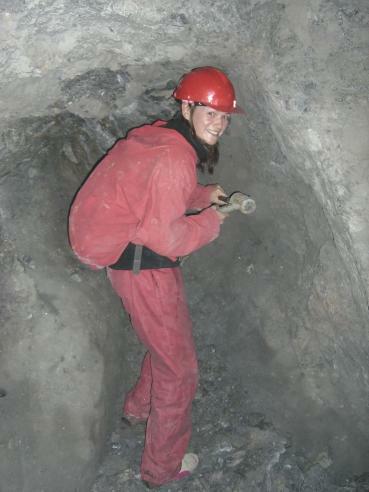 The miners are friendly and we are allowed to assist them in winching up bags of minerals. It´s hot and heavy work. The miners in this part of the mine must shift 130 wheel barrows of mineral out each day. Each barrow is 80kg and they will receive 50 bolivianos pay per day. This equates to about 3 pounds 30p. Moving further into the mine we learn that the miners chew coca leaves and drink their 97% alcohol in order to stay alert at the altitude and under the conditions. The miners worship Pachamama and Tio (Uncle George) and pour alcohol onto the ground as an offering to keep them happy before indulging themselves. At this point of the tour I am feeling clostraphobic and concerned over the safety of the tunnels. As you can imagine I am delighted to discover the next part of the tour involves setting off a stick of dynamite so we can feel the ground shake. The guide builds the bomb from our supplies and one of our group places the dynamite in a suitable alcove. She returns and we put out all our lights awaiting the explosion. It arrives and not only do we hear the blast but the ground shakes and the wind rushes down the mine shaft past our faces. I am left wondering if the back of the protective trousers I have been given are still yellow. Undeterred the guide leads us further into the mine. I am absolutely terrified at this stage but can`t let on as Hannah is having a blast. We come across another miner who has discovered a rich mineral vein and is preparing the hole for the dynamite to blast it out. This will take him two hours and is done with the only tools he has, a hammer and chisel. Again the miner is friendly and poses for photos and allows us to have a go at hammering the hole. I can`t concentrate at this point as I can feel small explosions elsewhere in the mountain from other miners. Hannah of course is first to get the hammer and chisel in her hands. We give the miner some supplies for which he is very grateful and set of on our way. Thankfully this time we are leaving the mne and I am delighted to see the light of day and breath fresh air once again. Perhaps accountancy is not so bad after all. To finish the tour the guide informs us we can carry out a couple of explosions as a thank you to the miners, seems to me they just like to blow things up for fun. As she takes the dynamite and detonator from her handbag she asks for a volunteer to put the bombs in place on the side of the mountain. I am franticaly trying to find out of Scotland have made it to Euro 2008 and don´t notice Hannah putting herself in the firing line. We are all in position and Hannah slowly makes her way up the mountain to the detonation site. She happily places the bomb on the ground about 200m from where we are all standing and the guide lights the fuse. Hannah, I can only imagine fascinated by the sparks, stands and stares at the lit fuse. After 10 seconds or so the guide bellows "RUN HANNAH RUN". Panic sets in, not because my new wife may be blown off the mountain, but I discover Scotland are one down to Italy at Hampden. Hannah struggles to sprint in the altitude but thankfully makes it back to the group just as the first explosion hits, I`m given a ticking off for not getting all this on camera. After our tour the group is quite shell shocked. We all head of for lunch before catching the bus to Uyuni.